Sometimes you want a hearty breakfast that you can eat on the go or throw in your bag to take to school or work. Usually the most portable of breakfast ideas are carb and sugar loaded. 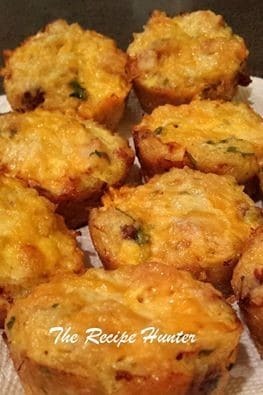 And these tasty breakfast egg muffins. You decide what meat, cheese and vegetables you want to put it in making the combination possibilities endless. And since you make a bunch in advance you have ready to go breakfast options all week. Get the kids involved as well by letting them choose their own ingredients. You can add chicken, beef, cooked mince, spinach, sausages, ricotta cheese and lots more as per your taste. The sky’s the limit! 6 Eggs beaten with 2 tbsp milk, salt and black pepper to taste. Add veggies of your choice along with cheese, pour beaten egg mixture on it. Let muffins cool for a few minutes before removing from the muffin pan or cups. Loosen gently with knife if they seem to be sticking. Eat immediately or let cool completely and store in plastic bag in refrigerator or freezer. The Egg Muffins can be reheated in the microwave.